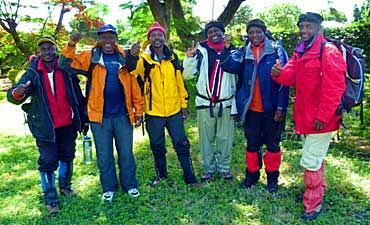 Understanding The Wilderness Zones Of Kilimanjaro. Scroll Down For Details.. 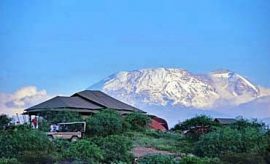 The lowest zone on the foothills of Mount Kilimanjaro in Northern Tanzania is thought by many to be the least interesting, since it is settled and under cultivation, offering little in the way of wilderness experience or wildlife encounters. 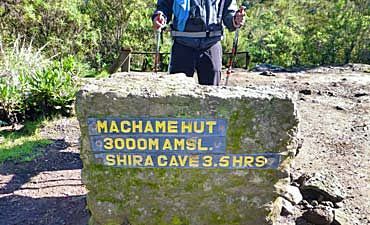 But it has a richness of its own and offers much to the discerning visitor beginning a Kilimanjaro trekking tour with Uhuru Trails by AfricanMecca. From 800 meters to 1800 meters, the rich land, watered from the mountain above, was formerly lowland brush and forest, but has been cleared over centuries to make way for traditional crops of bananas and yams as well as potatoes, beans and maize. Northern and eastern areas are arid and dusty for agriculture and retain something of their former character. Plantations of pine trees for fuel and carbon credits are a more controversial development, but the orderly rows are aesthetically attractive as are the coffee plantations on the southern side of the mountain. Wild flowers can still be seen here, the poisonous Lantana camara with its pretty heads of tiny pink and yellow flowers spreads everywhere as do many clovers. In front of tangled hedges of clematis and climbing pea, verges of feathery penisetum grass and blue spikes of coleus thrive in the hot sun. You may even see the elephant trunk flower, a beautiful red, green and yellow balsam with a curled tube shaped like an elephant’s trunk, which grows nowhere else in the world. 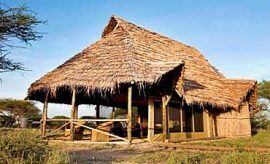 Chagga settlements intersperse grassland and crops, affording opportunities to learn about the local people. Their goats, cows and chickens also move freely in the area. Farming has caused most wild animals to move higher up into the forest, so expect to see more in the transition belt. 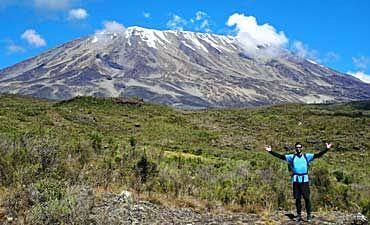 Kilimanjaro highlands travel in East Africa is best idealized in the tropical forest zone which starts from 1000 meters to 2800 meters. A number of small mammals, such as hyrax and bush babies venture amongst the crops looking for food, as do many birds, but most retire to the forest for shelter. Bulbul and boubou, cascading their nightingale melodies, and robin chat fill the air with rapture at dawn and dusk. Brilliantly plumaged sunbirds plunge their needle-like curved beaks into the nectar tubes of scented tropical blossoms. Crested turaco flash unexpected scarlet underwings. 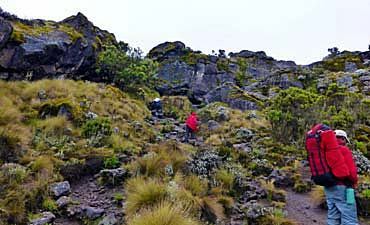 The tropical montane forest zone of the “Shining Mountain” is rich and beautiful. Exquisite swallowtail butterflies feed on nectar from blood-lilies. Nocturnal cats including civets and genets venture out at dusk with galago, aardvark and honey badgers, all animals you are more likely to hear than to see. There are shy antelopes from duiker to suni and even elusive leopard in the rainforest, but they are grim to spot. Bush pigs are present too. 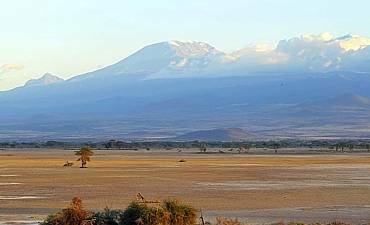 The north and west slopes have the presence of bigger game opportunities as the wildlife have access from the western plains of Kilimanjaro National Park and Amboseli in southern Kenya . Elephants, giraffes, buffalos and even lions have been spotted. The humid southern forest, wreathed in cloud, absorbs moisture that permeates the lower mountain reaches to irrigate the farmland. Scented powder-puff flowers of albizia add their heady perfume and veils of bearded lichen hang from tree limbs, dripping onto the mossy forest floor. Humidity is high and nights are cold. 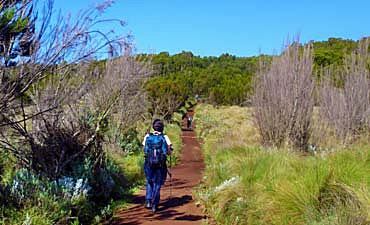 Experience a Kilimanjaro hiking safari through this shadowy forest where orchids bloom amongst ferns clustered along green branches, festooned with delicate trails of lemon-scented begonias. Drifts of mimulus and impatiens carpet the spongy forest floor. The northern woodland is drier with olives and twisted juniper. Colobus monkeys with white capes and tails, and blue monkeys (which are actually black and grey with a tinge shade of blue hair), can be heard as they swing through the overhead canopy of figs and camphor wood, whilst baboons stalk the paths. 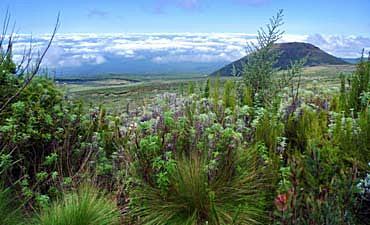 In the next transition zone between 2800 meters to 4000 meters, tall, silky heathers grow beside tasseled golden flowers of hypericum. Giant lobelias and groundsel appear in clearings, alien in form, fasciated and weird in outline. Club-like lobelias can reach up to three meters tall, but the groundsel soars to five meters before breaking into terminal clusters of tiny golden daisy flowers. The moorland and heath of the middle zone are drier and cooler than the forest, but the sun will scorch you unpityingly. Even so, daytime mists are common and nights are freezing. Amongst the unbelievable flora, you will find the giant protea, beloved of florists for its dramatic, long-lasting cone shaped blossom. Stretches of grassland are brightened with flowering bulbs in season: red hot poker and gladiolus in particular. Although the moorland is too high for most animals, there have been sightings on Rongai Trek of transitory game from elephants to elands, and rare spotting of canine lions have been seen on Shira Plateau. Mice and mole-rats are sufficiently abundant to feed highland civets, servals and ultra-mysterious leopards. 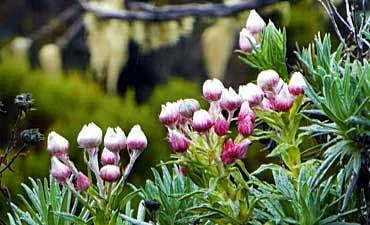 Amongst Erica species, which range from bell flowers inches tall to gnarled tree heathers ten meters high, gem-like sunbirds dart and hover. Buzzards also hover high in the sky watching for tiny, scurrying mammals in the carpet of alpine flowers, thistles and ornamental grasses. Many of the plants have evolved amazing strategies to shelter their flowers from frost in thick rosettes of waxy or hairy leaves. Some exude a slime which freezes over the buds, enclosing them in a protective glassy dome. It is a botanists’ paradise, but a fragile one, easily damaged by careless walkers, especially the slippery sedges and low-growing buttercups in the bogs. You will certainly see the opportunist White-necked raven, stalking round the overnight huts expecting tidbits from visitors on their Kilimanjaro climb expedition. The change from one zone to another is a gradual diminution of plant and animal life, and here at alpine altitudes of 4000 meters to 5000 meters, ground-hugging jewels like sky-blue gentians and tiny golden buttercups gradually peter out in favor of papery everlasting flowers, helichrysums and asters which have fine silvery hairs to insulate them and catch both sun and moisture. Only insects and spiders inhabit the rock crannies, protected from scouring winds that deter other insects, as well as most birds. In a few sheltered spots where soil and moisture can be found, delicate white Alpine arabis cling to life as they do from Lapland to the Alps. Plants have adapted to the 40 degree fluctuations between summer days and winter nights which causes a process of solifluction when the sparse pockets of soil expand and contract as they alternately freeze and thaw, uprooting less than 60 plant species still struggling to survive, so that the best adapted are more primitive life forms which have no roots at all. Moss balls tumble about and lichens encrust the rocks in symbiotic relationships between fungus and algae: living paintings in red, green and gold which persist up to the rocks of Kilimanjaro’s saddle area, formed almost three quarters of a million years ago by lava spilling over and between lower volcanic cones. 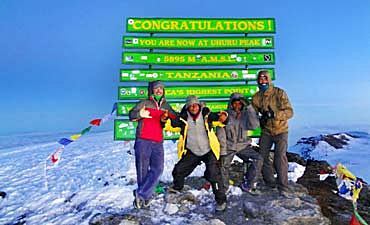 From these great heights, there are superb views of the craters of Mawenzi and the snow-crowned summit Kibo. When cloud clears from the forest below, you can see Mount Meru rising from the spreading plains more than 4000 meters beneath your feet. 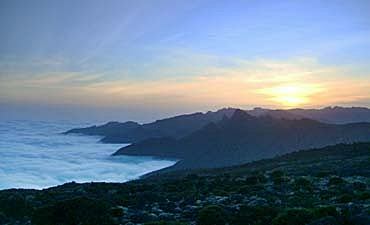 This is the totality of the African highland holiday experience. You may also see fabulous wedge-tailed Lammergeyers, spiraling to great heights on thermal currents to drop bones onto the rocks below, cracking them for their succulent marrow. But even they cannot endure the altitude for long and return quickly to more sheltered haunts. 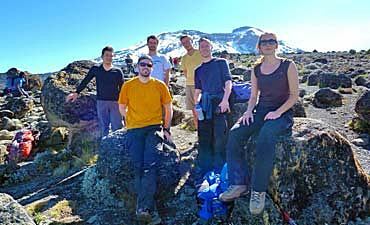 The pinnacle of your Kilimanjaro climbing tour with Uhuru Trails is your approach to the secondary peak, Mawenzi with awe-inspiring rock walls and dykes that demand the expertise of a skilled climber. The dykes are fantastic pinnacles of lava from which softer rocks have eroded. 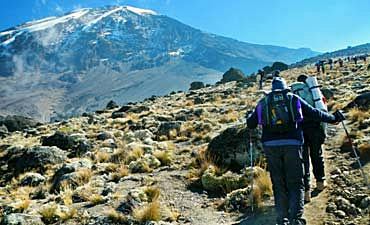 Cross the moonscape of the rock strewn Saddle with its mini parasitic cones to the gentler glaciated slopes of the summit crater Kibo. In spite of the enervating effects of this high altitude from 5000 meters to 5895 meters coupled with the bleak apparent lifelessness of the grandeur before you, your heart will swell with pride as you confront the top of the world. Your last stop before the summit assault will be cold and uncomfortable, but, oh, the glory of the star-studded sky, simultaneously dwarfing your human stature and bestowing a sense of God-hood to match your hardihood and achievement. On Kibo, there is no free water. It is locked into ice and porous rock. But life still exists in the form of helichrysums near warm, vaporous fumaroles in the cater and in lichens that grow so slowly they are likely to be among the oldest plants on earth, perhaps surviving thousands of years in these cryogenic conditions. 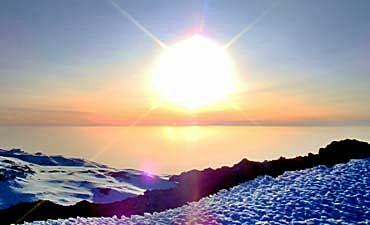 No one can survive in these arctic conditions for long, where searing hot sun by day presages freezing nights. The atmosphere is too thin to filter out radiation and oxygen is less than half that found at sea level. Nonetheless, a German local pastor, Dr. Richard Gustavovich Reusch, found a frozen leopard in the snow in 1926. 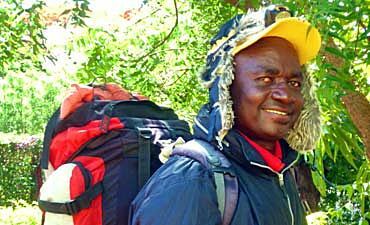 Reusch climbed Kili sixty five times during his life on planet earth. 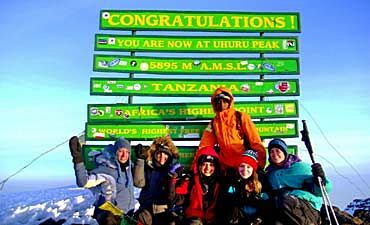 Incredibly, wild dogs have been seen historically ascending to the summit of Kilimanjaro. In 1962, five African wild dogs accompanied three explorers (Sir Wilfred Thesiger, Effata Jonathon and George Webb) to the summit, waiting until they had signed the assault book, then slipping away with apocalyptic speed. Ice cliffs ten meters high are all that remains of the retreating glaciers that once covered Kilimanjaro. Now you can look down 20 meters into the Inner Crater and 120 meters more to the bottom of one of the most perfect ash cones in the world. Yet even here, life triumphs in the form of bacteria in the boiling fumarole vents of a mountain that only seems to be asleep (read more on when is the best time to travel to Kilimanjaro).